St Austell ended Bodmin Town's stranglehold on the Cornwall Senior Cup with a 5-3 penalty shoot-out win. Dan Nancarrow scored the winning penalty as Bodmin failed to make it five successive cup triumphs. Bodmin took a 34th-minute lead through Lee Doel but Jordan Dingle levelled six minutes later. St Austell were the last side to win the cup before Bodmin began their remarkable run of wins, starting in 2010 and stretching through to 2013. 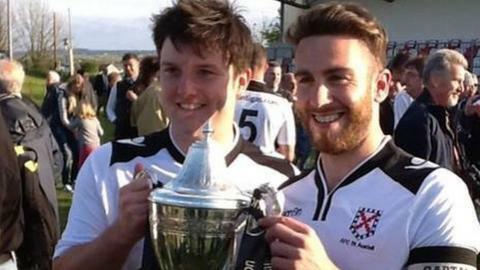 "Over the course of the game I think we probably edged it and we didn't mess around with the penalties," St Austell captain Chris Reski told BBC Radio Cornwall. Bodmin could well relinquish their South West Peninsula League title this year after winning for four of the last six seasons. "When you lose on penalties you're going to be heartbroken, but at the end of the day we weren't good enough," he said. "We didn't play like we normally can, we didn't get it wide, we just didn't play our game today, we just pumped it like they did and we went down to their level and suited them more than it suited us. "But five Senior Cup finals in five years, I've got to be proud of that."